I’m currently updating all the events and activities on over Easter for this page. If you see 2019 in the listing then you’ll know it’s been checked and updated! Yoohoo! We have an extra special invitation just for you, from Cedric the Easter bunny himself! The Pesky Bunnies have been working ever so hard (in between chocolate breaks that is!) to make this year’s bunny burrow packed full of Twiggletastic fun! Meet Cedric in his home, filled with confectionery curiosities, and then explore a secret hideaway of bouncing, colorful, chocolatey delights! Hop on down this Easter Holiday and see what all the nose twitching is about, Cedric can’t wait for you to meet him and explore his hoppy-home. This Easter holiday we would like to invite you to our Enchanted tea party workshops, hosted by Alice and her friends. At these workshops you will learn all you need to know about the good manners required at a tea party. As well as learning how to make tea pot cupcakes and cream tea scones with jam and cream. Alice and her friends will regale you with stories of tea parties they have attended and mishaps they’ve witnessed, as well as the magnificence of the largest tea parties in the world attended by Kings & Queens. You really don’t want to miss out hearing about all of their adventures! There will be more surprises along the way! You and your little Family Club members are encouraged to come dressed for the occasion. In the Secret Animal Garden you can see the real White Rabbit and take part in Easter Crafts, and by popular demand you can join join Dippy for some Disco Dancing. Admire the Easter Tree and meet the Easter Bunny*TBC. Join us for a fun packed family day and explore over 70 acres of beautiful grounds and ancient woodland. Activities available during the day and refreshments available from the Courtyard Cafe. Book your place via the Holt Hall website. Hop on board the Easter Eggspress over the Easter bank holiday weekend, for an “eggciting” day out for all the family. There is a FREE Easter Egg on completion of the Easter trail. Wildlife themed activities, crafts, games, face painting and more! If you are looking for somewhere to entertain the children this holidays, working, shopping, housework to do? We still have spaces at our holiday clubs. 8-1 or 8-5.30. Get in touch to make a booking. Call Marie on 07552045558 for more information. This Easter we’re inviting budding nature explorers to help us discover the number of moths and butterflies found on the estate. From Saturday 6 – Monday 22 April find out about these fascinating species during spring awakening and receive a delicious Cadbury chocolate treat, upon completion of the trail. Join the Kastle Kids team to hear the classic tale of Dumbo! Then get creative and make your own cute bouncy elephant to take home! Plus make an elephant balloon card for a friend or family member. Easter Egg Hunt – Join the Finnbar’s Force team to hunt for clues around the centre! Find them all, decode the secret message and collect your Easter Egg prize. Every child that takes part will win a chocolate prize, with the chance to win a selection of bigger prizes on the day too. Joining in the mesmerising magic as the circus to life with our Circus Skills Workshop! Plus decorate your own circus performer keyring! A whole bumper fortnight of scavenger hunting in the woods! Included in garden entry charge: adult £6.85, concessions £6.60, children £3.95 and free to Fairhaven members and under 5s. Hunt for the colourful eggs that will lead you to a chocolate egg prize. Face painting and Easter crafts for children. £2.50 extra per child for Easter Egg Hunt (every child gets an egg.) Please book in advance online. Limited spaces on the door. Easter at Holkham is egg-citing with plenty of activities in the hall,, Field to Fork Experience and the walled garden, where there will be fun for the whole family including our first ever Easter Food Fair on the Saturday and Sunday in The Lady Elizabeth Wing. Taster sessions and skills courses in a wide range of adventurous activities. I’m compiling all the Egg Hunts I find onto one page HERE. Join us for another spectacular Easter Eggstravaganza at Lingwood Village Hall! FREE. Craft stalls including kids toys stalls, home accessories, knit wear, jewellery and many many more…. It’s going to be cracking day! Lots to see and do for all the family! On Wednesday 10th April join us for “Safari Square” a FREE family day including a safari trail, bouncy castle, balloon modeller, face-painting and Bert’s Amazing Creatures. Ages: 6-10 Years with their grown-ups. Monthly interactive session of stories, music and play for 2-4 year olds led by Little People’s Drama Company. Join us for our ‘Winnie the Witch’ session this Easter Holidays. Sessions take place in the Circle Lounge at Norwich Theatre Royal, 10am – 10.45am. Monies raised from the event will be going towards Harry’s appeal 💙. We will be leaving the village hall at 11am and following a treasure trail up to Scotch Hill woods (just off sandy lane) where the Easter egg hunt will take place in the woods. Once the egg hunt is completed and all eggs are found including the amazing golden egg 😜we will make our way back to the village hall where the children will be able to hand in their completed trail maps and collect plenty of Easter Eggs to take home with them. We have children’s entertainer Steve sausage at the hall providing entertainment for the children , food and drinks , cakes , raffle tombola plus much much more . The actual Easter egg hunt is limited to a maximum number of children for health and safety reasons so please ensure your book your ticket early to avoid disappointment , all children will need to be accompanied by a responsible adult at all times. Tickets are priced at £3 per child and include at least one Easter egg 🐣. To book your ticket for this amazing event please message myself lucinda ratcliffe via Facebook or you can email me @ lucindataylor@live.co.uk. Easter Extravaganza on Junior Farm with young lambs who need help with their bottle-feed, meet fluffy bunnies and cute yellow chicks. Follow the Easter trail to win a little prize and don’t miss Bella and Barny’s Eggstraordinary Show too. Easter is a magical time of year on the Broads, and it’s even more special here at Broads Tours! There is also a free to enter colouring and drawing competition. After finishing the Nature Quiz simply bring it to the bar for an Easter Egg for all the children on board! We will be setting up an arts and crafts table on one of our terrace‘s along with an easter egg hunt! This will be going on between 12pm and 4pm. This is a free event for those with a table booked or even if you are stopping by for a drink with the kids! Please note you only need a ticket for the children attending. Come and have lots of family fun this Easter, one week before Esme and Claire run the London Marathon! All raising money for The National Deaf Children’s Society. The sessions focus on structured, outdoor skills with plenty of opportunity for creative and team play. Activities above will be spread out over three days. Dates: Mondays: April 29th, May 20th, June 17th, July 8th, Sept 16th, Oct 7th 2019. Each session is focused around a well known story supported with a recipe and learning card so that you can re-create delicious treats in your home kitchen. Children will also be able to enjoy cooked treats around the campfire on the day. We are hosting a cake and coffee afternoon to raise as much money as possible for Harry to get a ground breaking vaccine which is only available in New York. This fundraiser will include a charity raffle, tombola, brick a brac sale and craft tables which will include a colouring competition. Tickets for the raffle will be £2 a strip or 3 strips for £5. Or via cash which will then be transferred to the cause. Come and visit Hirsty’s and take a trailer ride down to the farm. There are a variety of activities to fill your day including Go-carts, bouncy castles, Zip-wire, crazy golf course and much more! Have a go at the Easter quiz and win an Easter Egg! Don’t miss out on the Eggtravaganza Hunt at 12.30pm and 3.30pm everyday. BRICKOLOGISTS – YOUNG ENGINEERS FUN DAY WITH LEGO! Our ticketed activities now cost £1.50 per child (aged 3+) and can be booked in advance by calling our events team on 01603 614541. You will receive your £1.50 back as a voucher on the day to spend in the Park Britannia Café on the same day as your activity. Mini Professors Science sessions (suitable for 3-5 year 11 months). £7.50 per child. Eaton Parl Community Centre. £8 a ticket (incl. activity and coffee + cake for the grown up) £2 per additional child. We’ll be making masks and there will be a giant colouring in sheet. The Forum in Norwich will be hosting a weekend of all things nature on 12th to 14th April 2019. The Norfolk Festival of Nature partnership brings many of the top Norfolk wildlife organisations together in the heart of the city, with the launch of a Nature Writing Book Club, a Saturday of nature walks starting at The Forum, and a Sunday of free children’s activities in The Forum atrium – as well as Jess French from CBBC’s joining the Sunday fun. We also have Issy Tree in conversation with Patrick Barkham on the Saturday evening at our Festival Debate, talking about her new book ‘Wilding’ about the rewilding of her Sussex estate. They will then be joined by a panel of experts to debate the festival theme of ‘The Future of Nature’. Tickets for the book group, walks, festival debate and Jess French are available throughout the various events throughout The Norfolk Festival of Nature Facebook page or website. Thank you, we cannot wait to see you there! Return of the Legend! Viking activities every day. Neil Paris brings Hiccup the Viking to life in this fantastic family drama, inspired by Cressida Cowell’s brilliant book How to Train Your Dragon. Treasure hunt in the wood with Easter prizes, make a spring garden and story time. Design a pizza veg patch, take home a plant and decorate biscuits. Children aged 4-11 years, must be accompanied by adult. (£8 per child, £4 per adult – up to two children per adult). This year’s Norfolk Spring Fling will be the biggest to date with over 70 experiences to take part in! Entry is just £9.50 entry and includes all activities, including tractor rides, science activities, lamb feeding and much, much more! Under 2s are free. There will also be a host of food options available including a farmers market or bring your own picnic and sit in one of our new picnic areas. Discover the wonder of creepy crawlies, nature and more with crafts, Science fun, dance workshops, puppets, AND some surprise real live creatures from Banham Zoo!! £3.50 for children over 5. Free for accompanying adults and under 5s. No need to book, just sign in at the Hostry on arrival. Could you and your family find all the painted eggs and save Easter?! A self-led QR Code trail around Norwich that’s fun for all the family and will test your team work and riddle solving abilities. With an appearance from the Easter Bunny themselves at the end and maybe even a chocolate egg to reward your troubles! Meeting at OPEN Cafe to begin the trail, please bring at least one smart phone per group. There is the option for your child to go on the walk alone with a member of staff, this will cost £8.50. Quasar Elite in Norwich is an indoor laser tag arena for all ages. We have 2 games £7 or have 3 games for £10 including a free drink that is valid any time over the Easter holidays. Also Tuesdays and Thursdays 10-12 unlimited play £10pp including a free drink. All subject to availability. Half price coffees for mums and dads all over Easter . £12 per child per session. 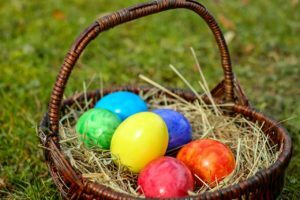 Over Easter we have Good Friday egg hunt in the City, Easter Saturday there is the 0-7’s Easter fun at the Playbarn as well as lots of Easter fun for kids during the Easter Service on Easter Sunday. Bring your wild things along for Easter family fun! Take part in our ever-popular Easter Trail around the beautiful Discovery Zone at RSPB Strumpshaw Fen in the heart of the Broads. Lots of fun, hands-on activity stations that will help you discover our spring wildlife. Suitable for all ages. This is a drop-in event so just come along on the day. Normal entry to the reserve applies plus £2.50 per child taking part in the trail. Four days of funny and challenging circus activities! Our trained tutors will follow your little bunnies in tumbling, somersaults, juggling and much more. Pack your lunch and smile and join us at the Oak Circus Centre! From 6 to 16 years old.